The C4 ships standard on this setting, it provides a slightly heavier and direct feel compared to the Freeride setting. The kite sits back a little bit more in the wind window when un-hooking, providing a more powerful load up and pop perfect for New School freestyle & wakestyle. The new C4 also has multiple trimming options offering customized handling and bar pressure. With fast and intuitive handling and un-hooked performance, combined with massive de-power and back line re-launch, the C4 is a new definition for Freestyle and Freeride Kiteboarding. The Contact Water Control System offers a clean control bar design, with simple safety and an easy-to-use trimming system. The Control System exceeds all Kitesurf/Snowkiting loading and release EU NORM safety standards. 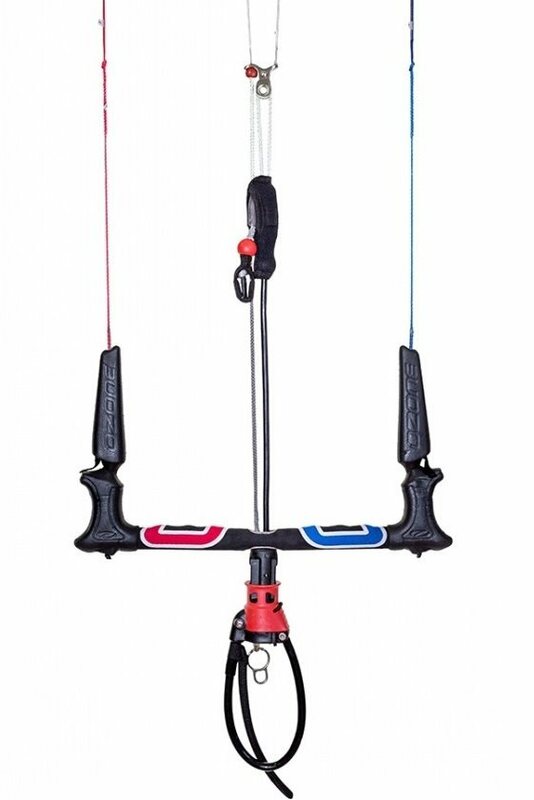 Megatron Quick Release The control system features Ozone’s proven Megatron quick release safety with total flag out of the kite. Easy re-assembly saves time and gets you back up and riding faster. Low Friction Centre Piece The control bar features a low friction aluminum centre piece designed to reduce trim line wear. Auto Positioning Chicken Loop Designed in conjunction with the bar centre piece, the Megatron spinning handle allows chicken loop auto positioning, offering easy unhooked riding and hooking back in. Magnetic trim handle The Magnetic trim handle connects to a magnetic neoprene sock covering the clam cleat, to reduce tangles when the trimmer is de-powered. PU Covered trim line & cast stainless steel de-power ring The tough PU covered trim significantly reduces wear when sheeting in and out, whilst the smooth running de-power ring also prevents trim line wear. Bar Sizes The Contact Water Control System bar sizes come in 45cm, 50cm and 54cm. The larger size PU chicken loop (sold separately) is perfect for riders with longer arms or for riders wanting even easier hooking in & out.